I scored so many good things on Black Friday and this is one of the outfits I got! 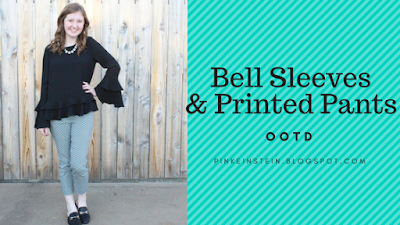 I'm not a big 'trend' person but when I saw this black bell sleeve top I knew I had to have it! My top is from JC Penney and I got it on Black Friday for $14.99 originally $39.99. You may laugh at me for this one and quite honestly I laughed at myself but my pants are from Stein Mart! My grandma had a coupon that she wanted to use so I went with her and ended up finding myself this pair of pants. They were on the clearance rack and the rack was 45% off the clearance price so I got them for roughly $8! These pants are very similar to Old Navy Pixie Pants (which I love!!) but they are just pull on pants, there isn't a button and zipper (it's kinda hard to explain). 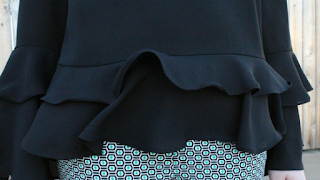 I love the green and black geometric print of these pants and the ruffles are darling! Lets just take a minute for these shoes.... I LOVE THEM!! I purchased these at Target for $22 and have been told they are very similar to the ridiculously expensive Gucci version. For the price, these shoes are wonderful quality. I know literally every blogger on the face of the earth has talked about these shoes but seriously, they are fabulous! So sorry for the lack of posts lately!